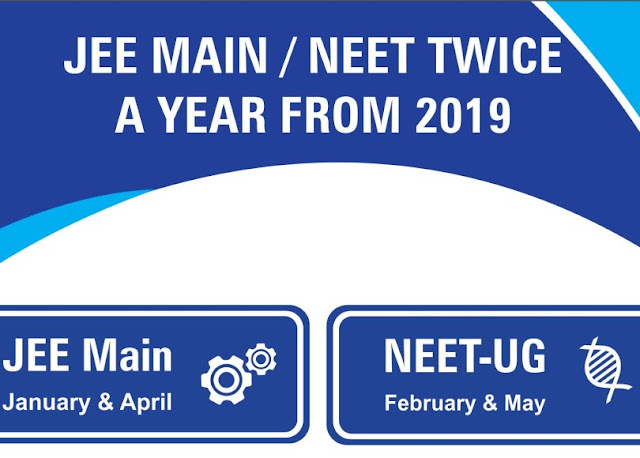 National Testing Agency (NTA) will be now conducting JEE Main and NEET twice in a year, as per the recent announcement made by Prakash Javadekar, HRD minister, on July 7, 2018. NEET and JEE Main are the gateway to two most important and popular courses in India. The exams will be conducted online twice in a year. On the other hand, NEET will be conducted in February and May and JEE Main will be held in January and April, respectively. Students are relieved by this sudden change in the process, as, now, they won’t have to wait for an entire year to reappear for the examination. Students can appear both times in both the examinations. In cases where the candidate has appeared both the times for the exam the best score out of both will be considered for the admission processes. So far, CBSE used to conduct the Health Ministry & National Eligibility Test (NET) for University Grant Commission and NEET for Medical Council of India (MCI). But from now on, both these exams, NEET and JEE MAINS will be held by the newly formed NTA. However, the JEE (Advanced) will continue to be held by the IITs. Students will get the benefit to choose a date of their convenience and choice as exams will be held over many days. Earlier, both these exams used to be conducted on one single day in a year, which was the cause of stress in students. But now, students have more choice and adequate opportunities to bring out their best, as per a statement by the government. NTA will give chances to students to test their aptitude twice a year and all exams will be conducted in online mode for their benefits. For rural students, NTA would assign centres at district or sub-district level for training. The basic structure of the examinations like, structure, fees and format, will all remain the same. All the important dates and how to apply and all the related instructions will be uploaded on the official website of the ministry. The state of Tamil Nadu is in the opposition to this decision made by HRD minister to conduct NEET twice in a year. The state government has criticised and opposed the centres’ approach and believes that it will ‘create confusion’ among the students. K Asengottaiyan, School Education Minister, also said that a six month period is not enough for preparation, and they will bring this issue in front of the Prime Minister. NEET has always been a critical issue in Tamil Nadu. From 2006 till last year, unlike the other states, the admissions in medical universities in southern states took place only on the basis of class 12th board exam results. MK Stalin, the leader of opposition in the Assembly, also said that this decision is a conspiracy to keep the rural students out of the medical education system. The changes made by the centre are for the improvement of the education system only and students will adapt to it. The final goal is to make the entire process more transparent & flexible and make it available for all. Filed under Indian Societies Act, the NTA was recently formed as a society in 2017 and is a self-sustained and autonomous testing organisation to direct all entrance examinations for higher educational institutions. In the budget-speech of 2017-18, the finance minister introduced the need for a specialised body in India for examinations. The government believes that NTA will create a high-reliability level for assessing aptitude and will also benefit all the candidates. NTA will initiate by conducting those examinations first, which were conducted by the CBSE and in due course, once fully functional will take up other exams too. NTA will also raise the standardised difficulty level to test aptitude and intelligence of the students.